This was a different exercise Thursday than it was during LeBron James' seven seasons as a Cav. CLEVELAND -- He got a firm grip, locked in on the target, took aim and launched his shot with about seven minutes left in the game Thursday night at Quicken Loans Arena. It would be the last shot he took on behalf of the Cleveland Cavaliers that night, so he intended to make it a good one. By then, his team was already being spanked by 30 points. Frustration was setting in, and the last thing he wanted to see was LeBron James -- or “LeQuitter,” as he was shouting at the time -- smiling at the end of what quickly turned into a laugher of a homecoming for James. 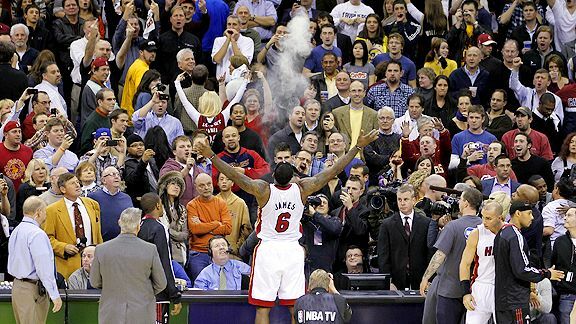 Standing five rows directly behind the Heat's bench, the man in the blue jeans, white T-shirt and filthy mouth launched an object that was headed directly toward the back of James' head as the superstar sat unaware watching his new team finish off his former squad. This time, it turned out to be knotted rally towel, which fell about two feet short of striking James before it was swatted down by a Heat security officer. Maybe that fan -- who was quickly whisked out of the arena with a taser aimed at his back by police -- wasn't aiming at James after all. Perhaps he was attempting to do everyone in the building a favor. Because someone probably should have thrown in the towel for the Cavaliers way before things got as ugly as they did in the fourth quarter of Miami's 118-90 victory that was part coming-out party, part confirmation hearing for James. LeBron announced he was joining Dwyane Wade and Chris Bosh in Miami on July 8 and signed his free-agent contract July 9. But Dec. 2 should go down as the day he officially laid a foundation with his new basketball family by torturing his old one with 38 points, eight rebounds, five assists, one block, a steal and no turnovers in 30 magnificently efficient minutes. It was a team-building experiment for the Heat (12-8), who extended their winning streak to three games since that devastating loss in Dallas a week ago that threatened to destroy the fabric of a team that has barely had enough time to develop any chemistry. You have no choice but to be connected when there are 12 men on one side and 20,562 fans on the other who lustfully booed, cleverly chanted and obnoxiously heckled James in his first game back in Cleveland after bolting in free agency for Miami. But even those fans probably wouldn't have complained if the league had suddenly instituted a mercy rule that put an end to the sadness that quickly turned to madness by the start of the fourth quarter. That was when I left my seat in the press area in the second deck and made my way to the seating section on the floor level near the Heat's bench. James' night was through after the third quarter, so the only suspense remaining was to see how much he would hear and see from fans from his seat on the bench as the final 12 minutes of the game played out. To James' credit, he largely ignored the chaos that started when someone threw a battery from the stands that landed right in front of the Heat's bench. That drew a warning from the public address announcer. The battery was thrown right around the time when a man apparently tried to rush the court from one of the tunnels leading to it but was picked off by a security officer, which led to a scuffle. As the Heat's lead grew, so did the craziness in the stands. One fan wearing a Heat jersey was showered with cups of beer in the upper deck. He didn't duck. Instead, he basked in the beer until he was escorted out. Then came towel man. Maverick Carter, James' business manager, left his courtside seat moments later and had to be escorted through the crowd by three bodyguards. James, meanwhile, was oblivious to his surroundings. Or at least he did a remarkable acting job. The “Delonte West” chants didn't affect him. The “Akron Hates You” barbs didn't make him crack. He simply sat, pointed a few times at familiar faces in the crowd and shared some inside jokes with Wade on the bench. LeBron did have a few petty moments, especially in the third quarter when he set a Heat record by scoring 24 points, which drew more fan ire. He seemed intent on taking the bulk of his shots directly in front of the Cavaliers bench. He plucked his jersey or taunted Cleveland's players after scores. At one point, Anderson Varejao retaliated by snatching off James' headband. As the final seconds ticked away in the fourth quarter, James and his teammates ran through a human tunnel of security officers that lined their path from the bench to the visiting locker room. I'm familiar with only four people who roll like this: The President. The Pope. Justin Bieber. LeBron. That's the list. Veteran Heat forward Juwan Howard has been in the league for 17 seasons and has seen some craziness happen at games. He was glad things didn't get any worse than they did Thursday night. Even after seeing the battery land on the court, Heat players said they didn't get rattled. There was a good reason things didn't get completely out of hand. No fewer than 14 uniformed and plainclothes security officers guarded the area near the Heat's bench in the final eight minutes of the game. At least five fans were escorted from their seats to the concourse for their gestures toward James. By the end of the night, Cavaliers officials reported one arrest, four ejections and 36 confiscated T-shirts or signs that were deemed inappropriate. Of course, the Heat were facing a Cleveland team that is struggling through life without LeBron. The roster is a collection of supporting-cast players in need of a star. It's a group of Kardashians without Kim, the Commodores without Lionel Richie. You could have picked eight fans out of the stands Thursday and they would have played with more fire than the Cavaliers' primary rotation of Mo Williams, J.J. Hickson, Varejao, Anthony Parker, Joey Graham, Antawn Jamison, Daniel Gibson and Ramon Sessions did at times. Early in the second quarter, when Miami pushed its lead to 15, it was obvious that LeBron's homecoming game would have a hard time living up to the hype. From a build-up-to-bust ratio, the game ranks right up there with Y2K, New Coke, Milli Vanilli and "Waterworld." Still, the Heat passed a significant test Thursday. They banded together even more strongly under a level of adversity that could have sent them splintering apart. They won't face a tougher atmosphere than they did in Cleveland on Thursday. At least not until they return March 29. Heat center Zydrunas Ilgauskas, who also faced his former team for the first time after spending the past 14 years in Cleveland, doesn't expect the crowd to warm up to the Heat by the return trip. As the rebuilding Cavaliers fell apart, the Heat took another step toward coming together. LeBron finally allowed himself to smile at the end. He might be getting the last laugh for a while.